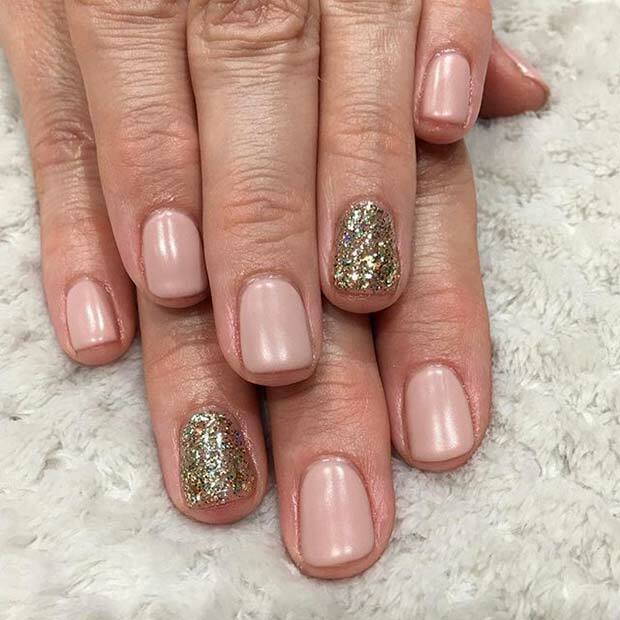 Add some sparkle to your nails with glitter, one of the many great things about glitter nails is the design possibilities. You could have something chic, bold, subtle or whatever you feel like. 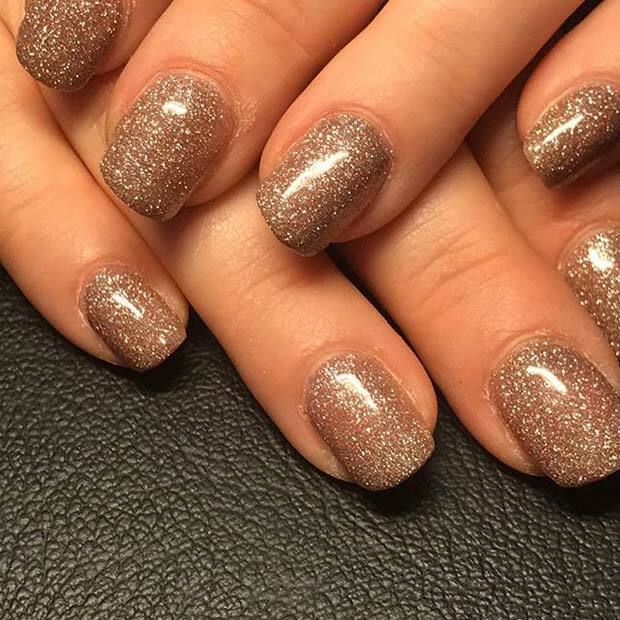 Glittery nails are a must have for 2017 so we have put together 23 of the best glitter nail ideas to get you inspired. Take a look there is something for everyone. First up we have this funky design. This one features light pink nails with glittery triangle accents. Art like this is great if you want to add a subtle sparkle to your nails. It is a trendy design that could be re-created with any colors. Nails like these would be great for the holidays. 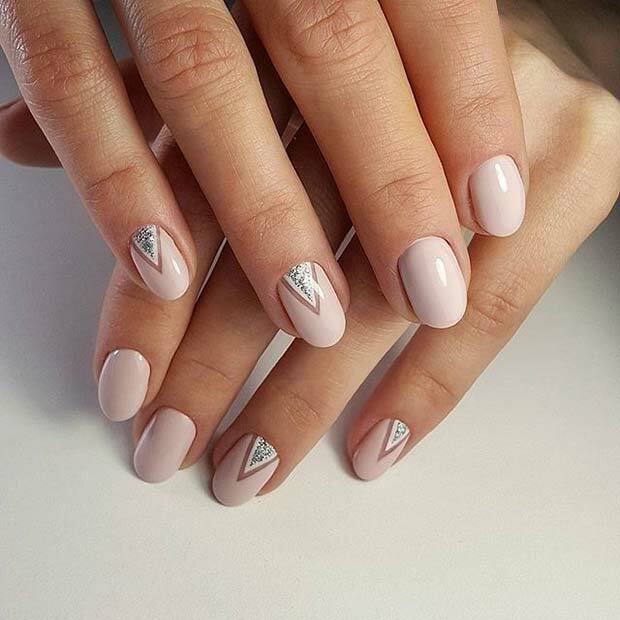 Almond shaped nails are our favourite, these have become a must have for 2017/2018. Combine this shape with dark matte polish colors and glitter and you have a trendy set of nails. A design like this one is just gorgeous, and most importantly, super easy to re-create. We recommend this design for a Thanksgiving dinner or a Christmas party. 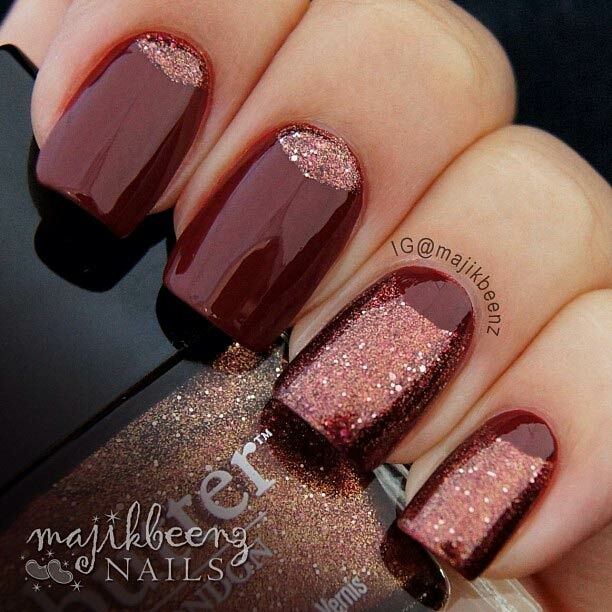 A glittery manicure like this will give you a bold look perfect for the upcoming holidays. You don’t have to go for full on glitter you could have a subtler design like this. The nails have a clear coat that gets sparkly towards the tip. Nail art like this will suit anyone. Products used: Zoya ‘Pepper’ and Butter London ‘Brown Sugar’. 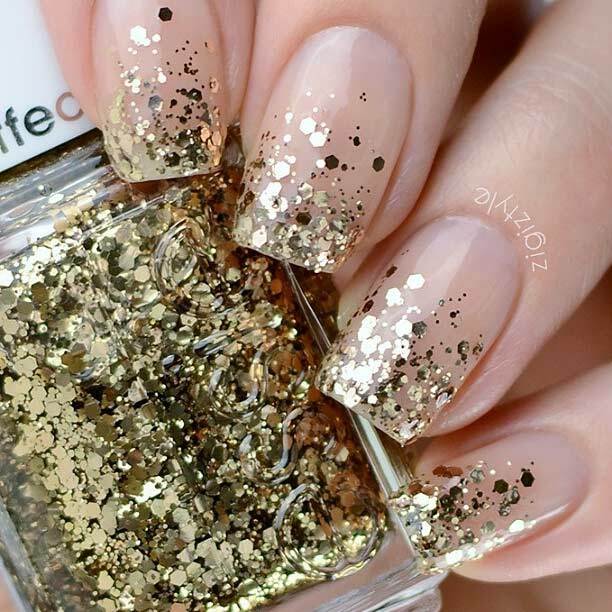 Give your short nails a touch of glamour with gold glitter. Many ladies go for the longer nails but here is how to have short nails in style. The manicure features a light polish and a gold glitter accent nail. You could recreate this with any polish and glitter color but gold is a great choice for holidays. Mix up your usual French manicure by adding some gold sparkle. Glitter nails like these would suit any occasion but would be perfect for weddings, proms and other special events. A design like this is a chic and stylish way to wear glitter. If the brighter colors aren’t your thing then you’ll love these dark purple nails. 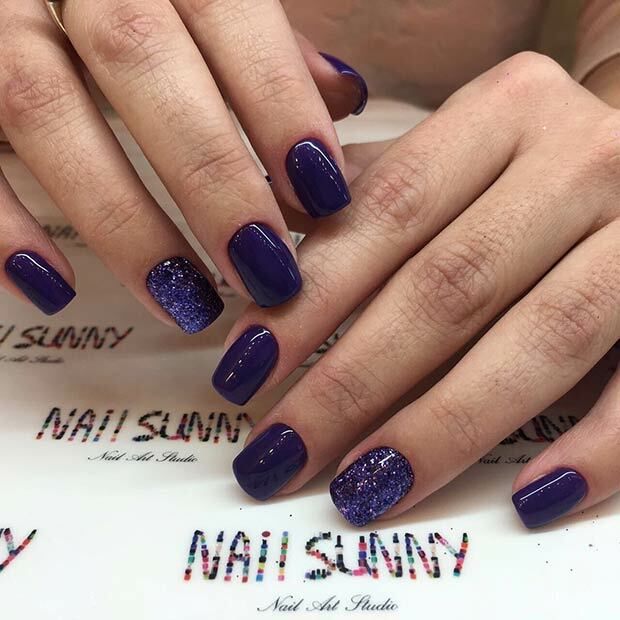 This creation features glossy polish with a purple glitter accent nail. You could have this done at a salon or even have a go creating this yourself. 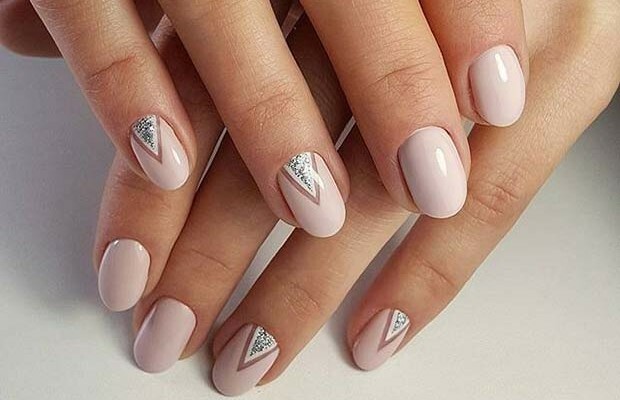 Nails like these are trendy and will give all the girls nail envy. Our next glitter pick is perfect for Christmas or New Year’s Eve! These feature a light polish with pink and silver glitter. Nail art like this is bright, bold and fun. A design like this would be great on short nails to. You could re-create this with different glitter colors. Blue or purple would be a stylish alternative. Love glitter? Then this nail design is for you! This all-over glitter manicure is sparkly and bold. You could create this look yourself with a glitter nail polish. You could choose any color but this is great choice for a night out or special occasion. Long or short nails would look gorgeous in glitter. Step up your sparkle game by choosing nail art with glitter and gems. 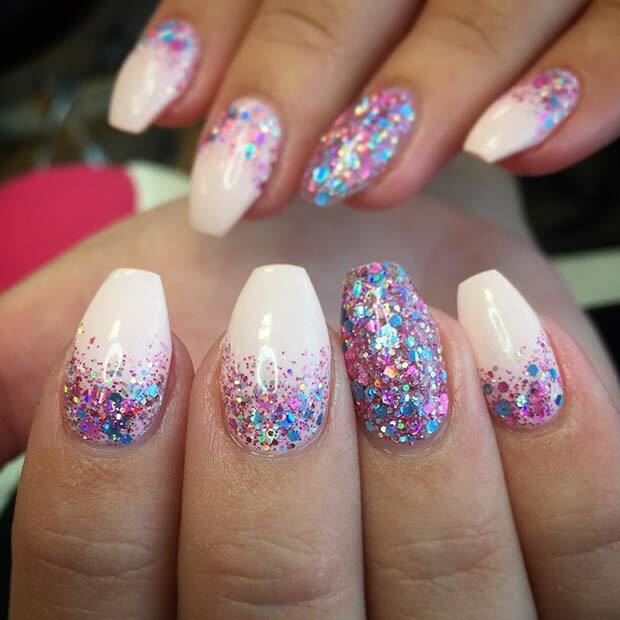 This stunning creation features a light pink polish with glitter nails and crystal nails. 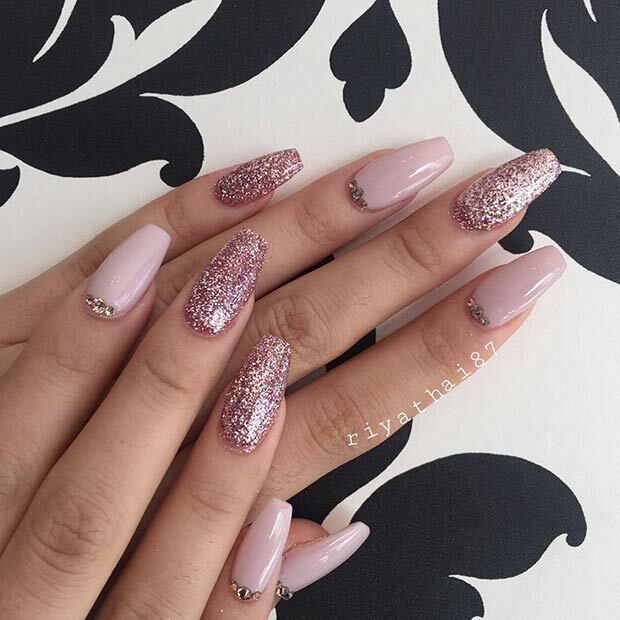 Nails like these will wow! You could take inspiration from this and make it unique to you by choosing different colors and crystals. The possible ideas for this combination are endless. 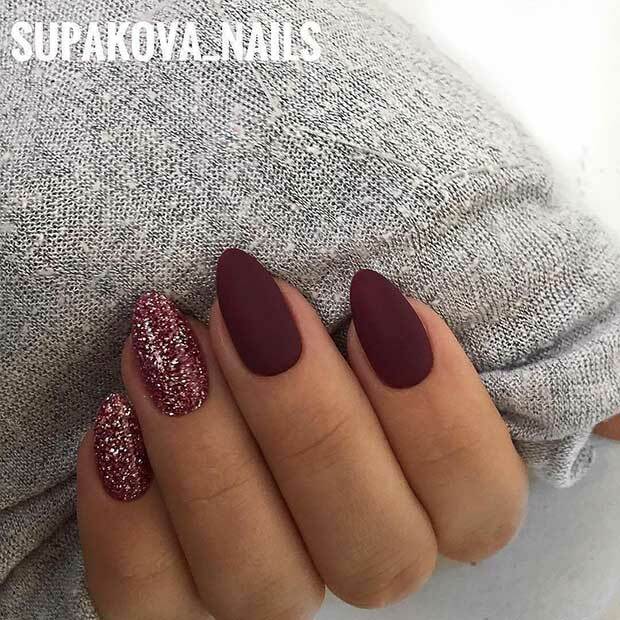 Look pretty in burgundy this season with burgundy and gold glitter nails. As you can see short nails look gorgeous in a glitter polish but longer nails would look amazing too. 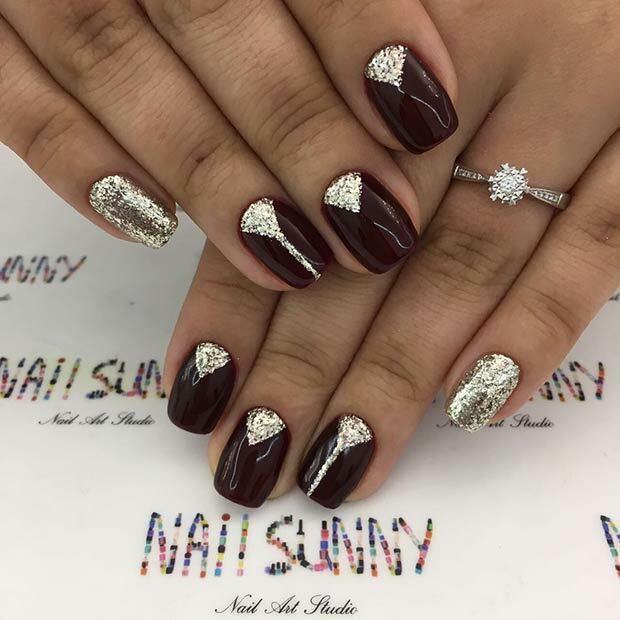 You could create this design at home with a gold glitter polish, dark burgundy polish and some Scotch tape. This design screams holidays!